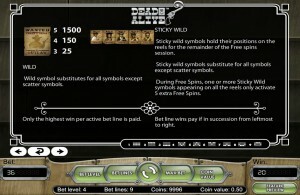 Developed by popular slots maker NetEnt, Dead or Alive is a 5-reel, 9-line slots game that you can play at SlotsClub.com and around the Web. It’s a free online slots game, and you can play it for fun as much as you like. You can also play for real money. The maximum bet is 18 coins, and the total jackpot that you can win on a single spin is an impressive 54,000 coins. This slot game is straightforward and plays fast. It even has an auto mode that lets you automate up to 1,000 spins, and you can pause or cancel that feature at any time. The small coin size is just one penny. All nine lines are active no matter what you bet. There are four bet levels, however, and the level acts as a multiplier for both your wager and any winnings. Even if you choose to play for just a penny a spin, the top prize is still 270 coins. Dead or Alive pays homage to classic western movies. You play the role of the noble lawman tracking down five of the most wanted. Or perhaps you’ve taken the position of sheriff in a town frequented by them. The trappings of the genre represented here include six-shooters, bullets, sheriff badges, ammo belts and holsters, cowboy hats, spurred cowboy boots and of course shot glasses filled with spirits. In between spins, you can hear the wind rustling, porches creaking and dogs barking. There’s still sunlight for the time being, but there’s dark clouds in the distance and flashes of lighting. When you spin the reels, you hear change being dropped into the machine and a mechanical clank. When you win, there’s a loud celebratory noise, as if you’ve just dropped the bad guy in a duel. 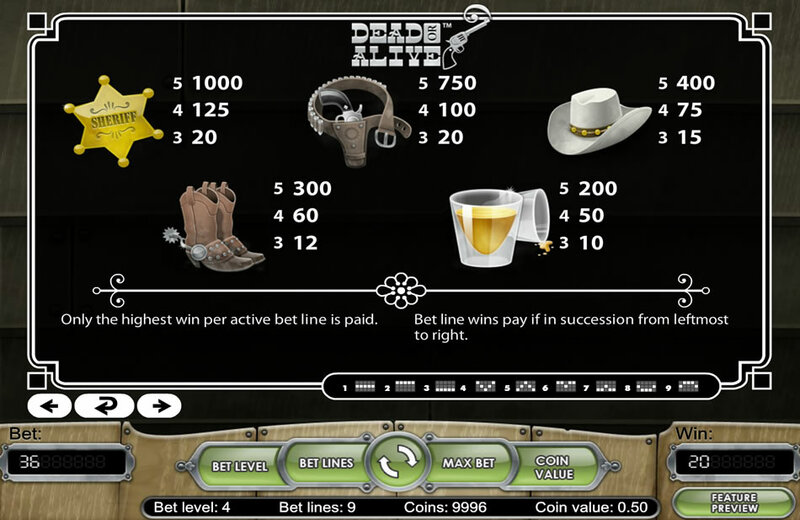 Dead or Alive pays out the highest win per active bet line, and lines win when one or more of the same symbol or wild symbol appear in adjacent columns from left to right. The blank wanted poster is the jackpot symbol and pays out 1,500 coins with five across. It’s also the standard wild symbol. The scatter symbol has an image of crossed pistols. Three or more scatter symbols anywhere on the reels award 12 free spins. Free spins can be retriggered once per free spin session. 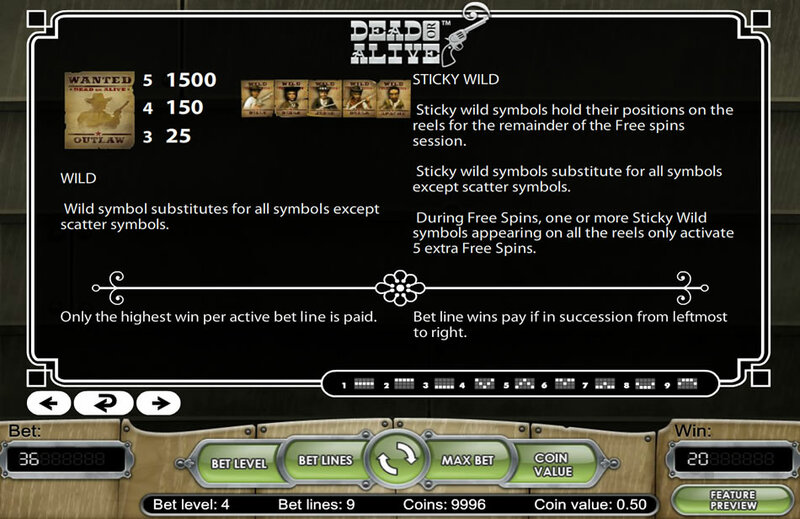 During free spins, the wild becomes sticky and remains in place throughout the free spin session. That means that you can build up wilds over the course of the session. In addition, the first appearance of a sticky during a free spin session gives you an additional five free spins, so at least 17 free games per bonus round is likely. 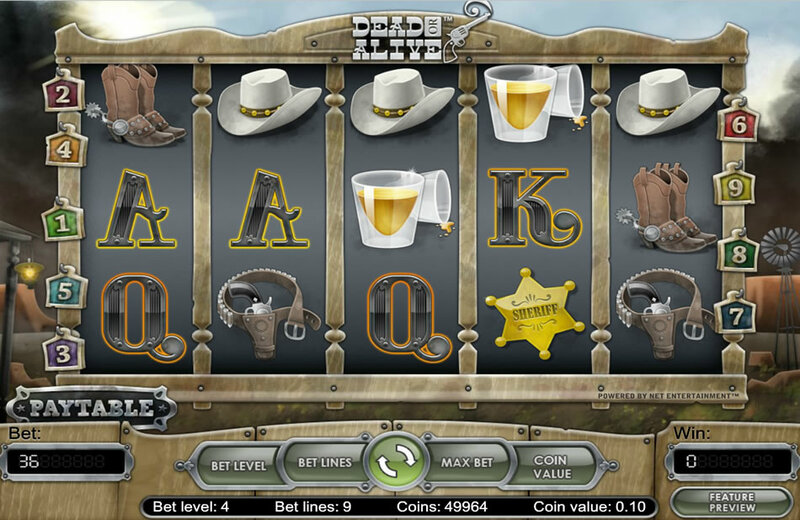 Dead or Alive by NetEnt is a 2D slot machine in the Vegas slots tradition, and it includes all of the bells and whistles and polish that gamers expect from NetEnt. The theme is engaging, the artwork is fantastic and the music and sound effects help create an immersive atmosphere. A particularly nice touch is the background whistling in the style of Spaghetti Westerns. The reels have a realistic spinning action to them, and it’s satisfying when the fifth reel comes to a stop. 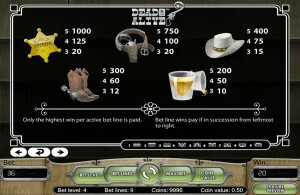 Dead or Alive isn’t NetEnt’s most complex or interactive slot game, but it’s a fun, effective one that every fan of NetEnt slots will want to work into their rotation, and it doesn’t hurt that this game can put out some sizable payouts on some rather modest bets.